Fighting thatch fires is difficult. Active fire protection in the loft space works well and slows progression of a fire. Thatch properties are unique and this solution is bespoke. Suppression of the fire within the loft space. Gives time to vacate the property. Gives time for fire brigade to get there and deal with the source of the fire. Thatch-Safe AttiX is installed with a robust linear heat sensor at relevant areas e.g. round the chimney and along the underside of the ridge. technology is used by NASA, military, marine and is approved worldwide. 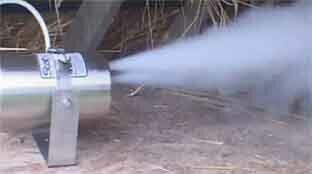 Fights fire by chemical interference when activated. Particulate stays in suspension in the air filling the void. Has a 20 year service life. Automatic or manual activation – control panel can also link to other monitoring systems. No water, no mess to clear up no damage to property. Excellent system for Listed Buildings. Installed and maintained by Fire Protection Specialists to ISO standards.